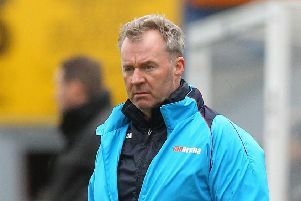 Spireites boss Danny Wilson is expected to name his assistant manager ahead of the vital weekend game with Shrewsbury Town. Over the years he’s worked closely with former Chesterfield player and manager Frank Barlow, but at 69 years of age, Barlow may not be looking for such a demanding role. At Blades, Wilson worked closely with Chris Morgan, who is currently coaching United’s under-21 side; he’s also been a young player at Barnsley during Wilson’s first Oakwell spell and it would be no surprise if he were to move 10 miles down the road to the Proact Stadium. Chesterfield chairman Dave Allen has indicated that all of Chesterfield’s current backroom team would remain in their current roles, the vacancy has occurred as former assistant Brian Carey left the club at the same time as Dean Saunders. Saturday’s home game is huge for both sides. Shrews scored in the last minute at Crewe to win 2-1 on Saturday and leapfrog Chesterfield, who conceded late on against Coventry City, thus earning only a single point. Wilson is awaiting news on the extent of Ian Evatt’s Achilles injury, Charlie Raglan (groin) is also likely to be missing from the defensive pool but winger Dan Gardner is expected to have shaken off the knock that kept him out of the Coventry game. Evatt was stretchered off early in the game with a swelling in his ankle but early assessment indicated it may only be a short term problem, though Saturday may come a little too soon for the influential central defender. Richard Wood, who started the game at left back, went on to give his best performance in a Chesterfield shirt after switching to the centre.